Bexley is the eastern-most London borough on the south bank of the Thames, nestled between Greenwich and Dartford. This blog, written by someone living and working in the borough, covers goings-on in and around Bexley. More about Bexcentric and its author. We are proposing to introduce a Sunday service to run every 30 minutes throughout the day on route B12. This would provide a new service on Sundays for Joydens Wood, Coldblow, and parts of Northumberland Heath with links to Bexleyheath and a number of railway stations. The route would run clockwise round the Joydens Wood loop before noon and then anticlockwise as on other days of the week. The B12 currently runs every 20 minutes Monday to Saturday during the day, and every 30 minutes Monday to Saturday in the evening. These proposals have been developed because of stakeholder and passenger requests for a Sunday service, including requests from Bexley Council and Kent County Council. For a long time, that’s not a sentence I had been expecting to be able to write, particularly under a Mayor whose stated plans for the bus service are merely to preserve overall mileage (i.e. not to expand bus services in the way that was done under his predecessor). So how did this come about? It’s a long but pleasing tale of all the right pressure being brought to bear by all the right people, with perhaps a hint of cunning in the mix. I don’t have any inside knowledge, other than from attending the London Borough of Bexley’s quarterly public transport sub-committee as a public observer, but this is the story as I understand it. For many years, under pressure from local campaigners, and indeed out of transport planners’ desire for logical public transport, Bexley had been calling on TfL to add a Sunday service to the route, which is the only one in their borough which doesn’t run on Sundays. The small south-eastern ‘loop’ part of the B12 route is mostly just inside Kent, across the greater London boundary. This is fairly common for TfL routes at the edge of the capital, and is a sensible acknowledgement that Londoners do occasionally need to travel slightly outside (and indeed it’s nice to be able to bring people from just outside to come and spend money in London businesses etc.). The absolute best TfL said they could do for a long time, therefore, was offer a very small amount of budget towards operating a Sunday service, but Kent County Council would need to find the remaining majority of the money needed. This unlikely proposition wasn’t actually dismissed out of hand by Kent. The councillors there apparently have a small budget that they can use in a way they personally see fit (subject to some sort of scrutiny, I’m sure!). Councillors there agreed that his budget could be used to fund the B12 Sunday service – hooray! So it happened then, right? No. The Kent councillors’ budget could only be guaranteed for a period of two years. (After all, which bit of any council budget can be guaranteed for much longer than that at the moment?) And two years simply wasn’t good enough for TfL. For service changes, TfL apparently require a minimum of five years’ guaranteed budget. In the context of an organisation headed by a Mayor elected for four-year terms, this seems somewhat surprising, but there it is. With only two years’ guaranteed funding, TfL wouldn’t be able to introduce the B12 Sunday service (even rejecting a suggestion that they do it on a clearly publicised two-year ‘trial basis’), and that was the end of that. ‘Enjoy’ the sight of these ‘Monday-Saturday’ panels while they last! There’s an interesting diversion from the main story here, which was, I thought, an amusingly clever response from Kent to TfL telling them their two years’ worth of money wasn’t good enough. The part of Kent which the B12 serves – Joydens Wood – is also served by a Kentish bus which similarly didn’t operate on Sundays, the 429. Good news for all our friends on route 429; in partnership with Kent County Council we will be trialling a Sunday service from 18th November. […] Tell your friends; it’s on a use it or lose it basis. 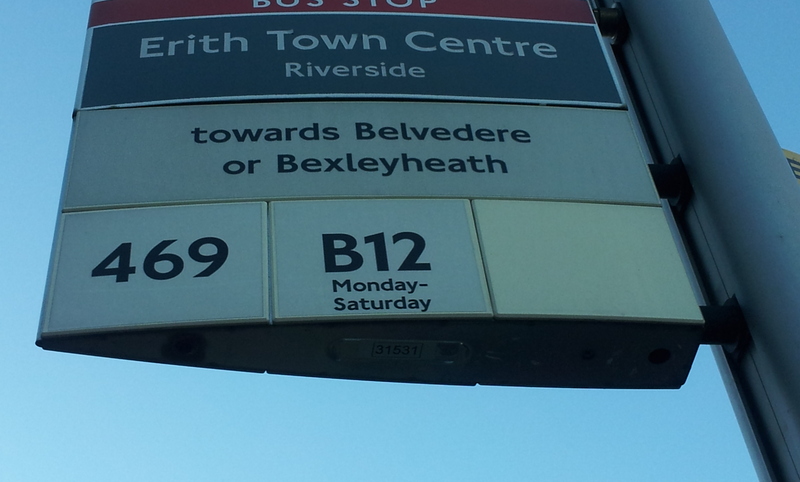 Back on the subject of the B12, despite the apparently fatal setback, Bexley’s transport planners had another idea up their sleeves. In 2011, Bexley Accessible Transport Scheme (BATS) had become the first community transport organisation to be awarded a London Service Permit by TfL, allowing them to run a special bus service, route 938. LB Bexley worked up a proposal with BATS for the organisation to run a Sunday service on the B12. It was a full, detailed proposal, covering exactly how it would work, types of ticket accepted, and expected subsidy required. Lots of thought and development went into it, demonstrating just how serious the local community and council were about wanting a Sunday service on the B12. The service proposed was not a full one, and only covered about half the B12 route, running just between Bexleyheath and Joydens Wood, but it was intended as a ‘better than nothing’ offering – an hourly service, which if I recall correctly would only have run during shopping hours. It was calculated how much subsidy this community-run service would need, and the proposal was submitted to TfL for their response on the subjects of a permit and the subsidy needed. What actually appears to have happened, though – and I am reading between the lines here – is that on seeing just what lengths the council and community were prepared to go to, just to pull together what would have undoubtedly been a substantially lower-specified Sunday service than a standard TfL offering, TfL felt shamed into stumping up the estimated £80,000-a-year cost of introducing a proper Sunday service themselves. I’m not sure what the subsidy BATS were asking for was, but I guess a calculation was done that more value would be had from simply paying up the full amount for a full service than paying part of it for a substantially lower frequency service covering far less of the day. So, suddenly, everything changed. No direct response by TfL to the BATS B12 proposal was forthcoming; instead, responses from TfL at (and between) Bexley’s transport sub-committee meetings changed from the previous strong negativity about a B12 Sunday service to intimations and hints that there would be very good news ‘soon’. Not in relation to the BATS proposal, but rather as a full service – exactly what had been sought all along. Whether Bexley’s transport planners had in fact worked up the BATS proposal in the hope of ‘shaming’ TfL into doing the right thing, we may never know, but if TfL had been hoping it wasn’t a serious campaign for a Sunday service and would just go away if they kept saying the money wasn’t there, the BATS proposal certainly called their bluff very effectively. Buses don’t stop here on Sundays – but they soon will! Perhaps as a sign of the straitened times TfL now operates in, the phase in which they repeatedly hinted at an imminent good announcement lasted a very long time – something like six to nine months. From what TfL were saying, a lot of this time was spent negotiating with the bus operator, probably trying to squeeze down that estimated £80,000 (which was, after all, the response to an FOI request in the context of them not providing the service, so would presumably have been made as high an estimate as they could realistically state!). The next Bexley transport users’ sub-committee meeting is next week, and what has finally emerged one week before that? The consultation on introducing a full Sunday service on the B12 bus route, which I’d encourage everyone reading this to respond to very positively! I use the B12 bus route to visit my parents, who live just outside greater London, 10-15 minutes’ walk from the furthest point of the Kentish B12 loop. It’s my mum’s birthday on the proposed launch date of the new service, 28 April 2013, so I know how we’ll be arriving at her house now. Thanks to everyone involved in this for their work in bringing her this very welcome bonus birthday present! We received a total of 109 responses, 107 of which were submitted online, 1 response came via email, and 1 response was sent in the post. Of these responses 106 were in favour of the proposal, 2 responses were against the proposal, and 1 respondent did not answer. After considering all the responses, which were overwhelmingly in favour of the proposals, we are now intending to introduce a Sunday service on route B12 to run every 30 minutes from Sunday 28 April 2013. Their full consultation summary and response is here (PDF). I’m a child of suburbia. Born just outside Zone 6, I spent my pre-teen years just inside it and the subsequent decade or so another few miles outside, in Kent, before choosing as my own first home with my then fiancée a house again back in Zone 6, with an easy walk to Crayford station and, at that time, an easy drive to work. Indeed, driving was as much a fact of my life to that point as eating or latterly having an internet connection: it was just something that I and those around me did; a means to an end, with little apparent alternative. The recent demonstrations outside the BBC about its plans to close 6 Music reminded me of Demonstration X in the late 1990s, when Capital Radio bought Xfm and ripped the heart out of it, installing high-rotation playlists and blander DJs. The demo didn’t change much about Xfm, but some cunning person from the BBC’s Greater London Radio turning up to hand out cheaply photocopied leaflets about how GLR was the capital’s ‘real alternative’ for music did change my listening habits. I gave the quirky station (which inspired 6 Music several years later) a try and soon became hooked on its mix of new music, haven’t-heard-that-in-ages music and, most relevantly to this post, intelligent talk about everything that’s great about London. Up to that point, like a lot of suburbanites round my way, I’m sad, if not ashamed, to say that I didn’t see London as the wonderful, welcoming place I now know it as, where I like to go at any opportunity for a walk, an arts event, a catch-up with friends, a hang-out at the Southbank Centre – any of the dozens of appealing things happening there every day. Instead, it was the nearby city that people grudgingly went into to work or study, and I only occasionally went into in my leisure time for specific events like gigs. In essence, GLR opened my eyes to the city as a thing to love rather than live next to, a place to discover and fall in love with every corner of rather than to nip in and out of based on which tube station is nearest to which specific destination. GLR was soon killed off by the same man who’s trying to kill 6 Music now, but the passion it inspired in me for London continued to grow and I shared this with my now wife when we got together and she became similarly enthused herself. The exception to the ‘drive everywhere’ rule of the suburbs was when it came to going to London for leisure (or occasionally work). This was (in part because of the Congestion Charge, I suppose) always done by train, after a drive to a station, so as our love affair with leisure time in London blossomed, our choice of home in 2004 was influenced by our wish to walk to the station instead. We’ve now had almost six years living at that home in Zone 6, and it’s been a period of discovery and transition for our relationship with London, even beyond that in the five years previous. I began to tire of using the tube to travel around in London, always disappearing down below London’s streets, missing out on the sights and sounds of the capital and instead entering what can often be an unpleasant environment, be it overcrowded, uncomfortably hot or simply dirty enough to ensure a day or so’s black nose-blowings afterwards. Accordingly, I started familiarising myself with good walking routes, and finally tackled what is perhaps one of the most daunting steps for previously car-dependent suburb-dwellers on the path to London enlightenment: getting to grips with the capital’s breathtakingly comprehensive bus network. With the benefit of hindsight and subsequent experience of other European cities’ buses, I must acknowledge that Transport for London do make casual bus use considerably easier than most other cities seem to manage, particularly thanks to their beautiful ‘spider’ bus route diagrams, which show all available buses in any area using a simple tube-map style with easy-to-follow mapping of exactly which clearly labelled bus stop to use – and iBus, the on-bus stop announcements. Properly discovering and beginning to use the buses was a real revelation: they perform well, provide far more insight into London’s geography (and better views!) than the tube, and for many journeys are no slower than the tube would be – sometimes faster. Suddenly, taking the tube seemed a poor second choice for travel within London. And gradually, the penny began to drop. These buses – frequent, reliable, reasonably priced – weren’t something for use only when in central London. They were operating day in, day out, here in Bexley borough, with Bexleyheath – where I work – having one of the most comprehensive bus networks in the south-east of the capital. If I liked using them in central London, why didn’t I make more use of them in suburbia? With that in mind, and for both health (it’s a 13-minute walk to our nearest bus stop) and environmental reasons, my New Year’s resolution in January 2009 was to use the bus to get to work more often – specifically, I set a target of at least one day’s bus commuting a week. In the first few months, I felt virtuous each time I made the effort to leave the house that little bit earlier and walk down to the bus stop rather than getting in the car. By the summer, I felt like I’d failed on the odd days when I *didn’t* take the bus – and not just to work, but to just about anywhere that could be accessed via London buses. It was a rapid and surprising adjustment of perspective which I hadn’t expected at the outset. There was just one problem. The incremental cost of a journey by bus, while (I think) lower in London than anywhere else in the UK, was still higher than the incremental cost of a car journey in our small, efficient vehicle. The up-front and fixed annual costs of having a car – servicing, MOT, tax, depreciation… – make the overall costs far more comparable, but were already being spent, just to have a car sat on the front drive, barely ever being used. Without it, it would be much harder (and far more expensive, e.g. over £5 for a return bus ticket to them from Dartford) to visit my parents a few miles away, beyond the reach of the London bus network, but our switch to public transport meant we couldn’t continue to justify owning a car for use only once or twice a month. When we retaxed the car in October, we did so only for six months: we sold it a month ago, once we’d finished using it to clear rubbish out of our house. In the past decade I have made the transition from what could perhaps best be labelled ‘London-curious’ to Londoner, and in recent years the transformation has been all the more profound from a car-driving visitor to the city to a TfL-dependent member of London’s community. What living in Crayford has done is allowed us to make that transition. This part of suburbia, which is more urban in nature than many other parts of Zone 6, has allowed us to sample, to experiment with and to become comfortable with a more ‘central London’ way of life. It won’t be for everyone, but no-one can really know how they’ll get on with it until they give it a go, and that’s what the suburbs can allow, indeed have allowed. Some people from inner London sneer somewhat at the suburbs, talking about suburban residents not being ‘real Londoners’. The London Transport Museum’s recent Suburbia exhibition showed how people saw the suburbs as a way to escape the centre of London and live a more wholesome life. Suburbia can be different things to different people, and undoubtedly many use it as a compromise position when on a journey from city centre to countryside. For us, it’s been a great way to make a mental transition in the other direction. Inner Londoners would do well to remember that there *are* those of us in the suburbs who are just as engaged (if not more engaged) with the centre of the city – its politics, its development, its transport system – as those in SE1 or N1. There are plenty out here who want to see the city thrive and feel every bit as much a part of it as those living more centrally: we just have a longer train journey home. Accordingly, I pay tribute to the corner of suburbia that we’ve lived in since 2004, and how it has helped us change our lives for the better over that period, and convinced us that we’re ready for a life in Zone 2 rather than Zone 6. Because, indeed, we are: we’re ready to the point of having a Sold sign outside our house, and an offer accepted on a flat in Lewisham. After a fraught buying and selling process we’ve finally exchanged contracts today and are due to make the move on Thursday. I’ll still be working in Bexley, but I won’t be living here any more, so I’m afraid that I’ll also be moving on from this blog as well (it was, after all, supposed to be about living in Bexley, although my inability to find much to say about that due to spending all our leisure time in central London did contribute to wondering whether perhaps we should move!). At one point we were mulling a move to Woolwich and ‘Woolwich-minded’ seemed a good name for a blog to replace Bexcentric. I’ve been struggling with ‘Lewisham’ for some time and the best I have so far is Lewishful Thinking, which isn’t exactly snappy. Better suggestions are welcome; I’ll keep you posted. For now, though, it’s goodbye to Crayford, Bexley and Bexcentric. Thanks for reading. Edit: Nine months later, I’ve finally launched a new blog in Lewisham: SE13URE. I’ve updated the Oyster v Gold Card spreadsheet (see January’s post) to take account of the apparent (or at worst, expected-at-end-of-May) availability of Gold Card discounts on Oyster PAYG off-peak fares. If you’re doing both halves of a return journey after 10am in a single zone (other than Zone 1) and at least one half of your journey starts between 16.00 and 19.00, it’s cheapest to buy a paper return with Gold Card discount. If you’re doing a return rail journey after 9.30am between Zones 1 and 6 or Zones 2 and 6 (in either direction), it’s cheapest to use Oyster (with Gold Card discount enabled) even if one half of the journey falls in the evening peak (16.00-19.00). The latter point assumes that a pair of post-9.30am journeys between Zones 2 and 6 are capped at £3.40, and a pair of post-9.30am journeys between Zones 1 and 6 are capped at £5.00, as suggested by the TfL fares guide. 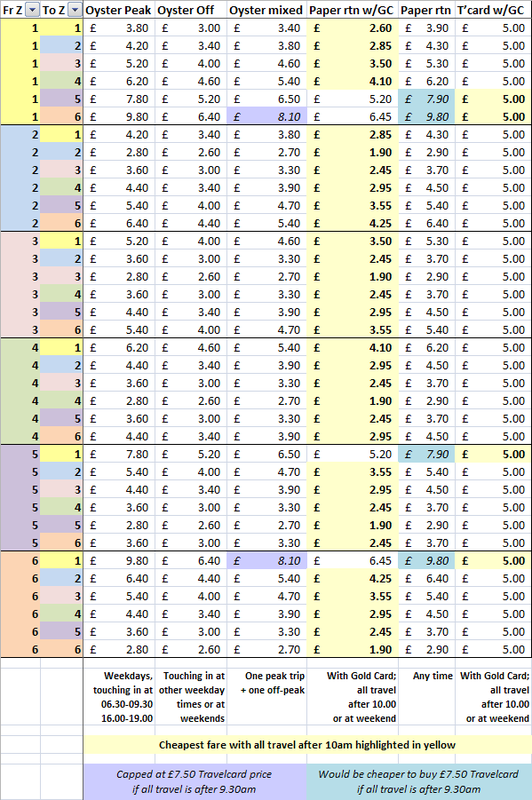 Apart from these exceptions, the rules set out last night still appear to apply, but if you want to check your own combination of singles or returns, download the Excel file and have a look at its two sheets (Single fares and Return fares) for yourself. No, there’s no reprieve for off-peak return fares and no removal of the punitive 4-7pm peak period, but there is (or was? **) some good news for annual National Rail Gold Card-holders. You need to register your Oyster card with your Railcard details. You can do this at all Tube, London Overground and some National Rail ticket offices. Yes – “Annual Gold card” had** appeared in the list of railcards eligible for the one-third Oyster PAYG fare discount! There was, of course, still a catch. Gold Cards, when used to purchase paper tickets, get a one-third discount on all tickets purchased after 10am on weekdays (and all weekend). The catch here is that the Gold Card discount on Oyster PAYG doesn’t apply during the evening peak period, 4-7pm. This means that for the common scenario outlined in my first post about this last year, to get the cheapest fare a Gold Card-holder still has to queue to travel into London between 4 and 7pm, but to buy a discounted single paper ticket rather than a return. When travelling back out after 7pm, the person can then touch in and get a discounted fare, resulting in an overall saving (for the journeys we’ve checked – I haven’t done anything comprehensive yet!) compared with buying a discounted paper return. In other words, this system still fails the fundamental test of whether it’s true to the number one principle of Oyster: you should be able to touch in and out and get charged the cheapest available fare for your journey – full stop. That’s the (depressing) theory. But does it work? My wife has an annual Gold Card, so on Sunday, armed with a highlighted print-out of the web page in case of dispute, we did as it says: headed for a Tube station (Oxford Circus, on Sunday afternoon) and asked at the ticket office for them to enable the Gold Card discount on her Oyster. The staff member didn’t seem as surprised or confused by the request as we’d feared he might, although he did take a minute or two of staring at his computer screen and my wife’s Gold Card to complete the task. So far, so good. Tonight we went into London after work. She bought a paper single with Gold Card discount to travel in at 5pm, but on the way back out at 9pm, to her motor memory’s great confusion, she simply touched in and out, just like me with my lowly Oyster bus pass. And sure enough, she was charged the discounted fare! It really does work. So, here’s an update on exactly when Gold Card-holders should buy paper tickets and when they should just touch in and out (after, of course, a trip to a tube station to get the Gold Card discount enabled on their Oyster card). You can link straight to this part of the post using this link. Your journey starts between 4 and 7pm on weekdays, and you will not be transferring onto the Tube, DLR or TfL Overground services to continue your journey immediately after your train. Your journey starts before 6.30am, after 9.30am* but before 4pm, or after 7pm. £5.00 for travel in Zones 1-3, 1-4, 1-5 or 1-6. Your journey involves both National Rail and TfL services (Tube/DLR/ Overground). Your journey is between 6.30am and 9.30am. You expect the total Oyster cost of all your travel that day, including some before 9.30am, to exceed the total daily price cap for whatever zones you’re travelling in – i.e. whatever price you’d pay for a one-day peak travelcard for those zones. I think that’s everything covered – simple, isn’t it?! – but please let me know if you spot any errors or omissions! Update: I’ve done the number-crunching and believe it or not there are still exceptions/anomalies, even to the above over-complicated rules. If you make return trips between Zone 6 and Zone 1 or 2, or return trips entirely within one zone, be sure to check my latest post. * I’ve seen no real-world confirmation of things with asterisks, which would be better than the old situation for Gold Card-holders (no discount before 10am, and minimum travelcard price of £5.00), so it seems hard to believe the train companies would have let them slip through. They are clearly suggested by the TfL web site’s information, though, so should be true. ** Where’s the Gold Card mention gone?! I thought that was going to be the end of this post, until I looked at the page I first linked to and quoted from above. At some point between Saturday evening and this evening, the reference to “Annual Gold card” has been removed! This recent Mayoral answer suggests that the Gold card discount is not operational until “the end of May”, so perhaps Saturday’s publication was a little premature. But if so, why has my wife been able to add the discount entitlement to her Oyster already, and benefit from a discounted fare on her way home this evening? As is so often the case where the train companies are involved, this is a messy implementation which doesn’t achieve what it’s supposed to achieve and ultimately raises more questions than I have answers. No sooner do I change the Bexcentric header back from the SoutheasternSnowFAIL alternative version than some more Southeastern news comes along! Given Southeastern’s reticence about explaining why they’d introduced such an utterly inadequate and pathetic ‘emergency’ timetable at the first forecast of snow, perhaps it should come as no surprise to learn that they really will only have their performance measured against that! To ask the Minister of State, Department for Transport if he will direct train operating companies to offer discounts on season tickets for commuters affected by reduced services in severe weather conditions. Passengers’ entitlement to compensation is set out in Passenger’s Charters, which we require each Train Operating Company (TOC) to have as part of its franchise. Where TOCs have introduced emergency timetables, including service reductions, as has been the case with many TOCs during the recent severe weather, compensation entitlements are based on the emergency timetable. TOCs may choose to go beyond these entitlements at their discretion. I’m assuming from Southeastern’s silence in response to my enquiry about whether the after-work return fare to London for Gold Card holders in outer London had truly risen by 43%, and their Public Affairs Manager’s total avoidance of this point too, that it really is the case. The utterly hopeless system which the train operating companies have negotiated, including the ridiculous OEPs which they themselves don’t even seem bothered about enforcing, means that Gold Card holders now have a tough time figuring out what on earth is the cheapest way to get from A to B – the exact opposite of what Oyster should achieve! So, to save time laboriously looking things up in future, I recently pulled together the various fare information from the TfL Fare Finder and National Rail Enquiries web site, compiling a quick reference Excel file containing one sheet for single journeys and one for returns. It speaks volumes about the train companies’ disregard for their passengers that so many columns are needed, but hopefully it does contain all the information you need for any railway journey within London. Simply check which zones the stations you are travelling between are in (PDF) and find the zone you’re going from in the first column and to in the second. That row then contains all the prices for your journey with the various different ways of paying. Anyway, below you can look at screenshots of the two sheets (click to enlarge), or you can simply download the whole file, best viewed in Excel 2007 (or later version). And if you agree it would all be a great deal simpler if the train companies just allowed Gold Card-holders to load their Gold Card discount entitlement onto the Oyster card in exactly the same way as holders of nearly all other Railcard types can do, why not join this Facebook group, or indeed do something useful by writing to your elected representatives and/or your train operating company? “Oyster loser” adapted from Oyster card by boxman – used under a Creative Commons licence. Last night I sent four last points, including some very simple yes/no questions, to Southeastern’s Public Affairs Manager via my MP. These questions were the ones I’d wanted answered which Southeastern had persistently evaded, twisted and misread in order to save face. With respect to your constituent I do not feel that there is any more I can usefully add. As outlined in previous correspondence the revised timetable implemented from 6 January was based on advice received from Network Rail in line with a detailed weather forecast predicting adverse weather conditions on those dates. I am sorry if [my name, spelt correctly] disputes this and I can only suggest he contacts Network Rail direct for confirmation. And that’s it on that matter. Looks like I got his king in check, so he’s upturned the chessboard and said he’s not playing any more and if I don’t like it I can ask someone else to play chess with him instead – someone easier for him to beat! However, I am sorry that [my name spelt wrongly again] has not received a response to his enquiry regarding Oyster Pay As you GO (OPAYG) sent to our customer services team last year and have taken this up with the team leader. By way of explanation, the implementation of OPAYG on the surface rail network in London is a national agreement between the Train Operating Companies, Transport for London (TfL) and the Department for Transport. To make OPAYG work, the rail industry’s fares systems in the Grater London Travel card area had to be integrated with TfL’s zonal fares system and pricing structure. However surface rail passengers using OPAYG will pay the cheapest possible single peak and off peak fare for their journey, ranging from £1.30 to £3.20 [er, that looks rather a cheap range!] depending on the time of day and the zones travelled. As a result [of our desperation to make money, not Oyster, which is totally unrelated to this, he should say], off-peak day return tickets in the Greater London Travel card area are withdrawn from 2 January 2010. Mm. I bet TfL devised OEPs, too? I despair. I think I’ll ask my MP if there’s anything more he can do to demand a reply from Southeastern to at least the simplest of my queries from last night. After all, why should a company like Southeastern take hundreds of millions annually in state subsidy without having to answer, honestly, to taxpayers such as myself? Update: my MP has replied to me and does not wish to pursue my questions any further with Southeastern. He instead suggests I go via (no pun intended, train-company-name-spotters!) London Travelwatch, as Southeastern also suggested. He will also keep me posted with Southeastern’s review outcomes, too. Well, I’ve come this far so I suppose I’ll have to try London Travelwatch, although its reputation doesn’t exactly fill me with confidence. In the mean time, if anyone can get this tale and these unanswered questions into any relatively mainstream media, please do! Thanks to everyone for reading and commenting on my correspondence over the past couple of weeks. We now know what we’re up against with this mendacious failure of a company and, frankly, the more quickly I can move somewhere where I can use the DLR and buses more and Southeastern less, the better.